Ages 18 months through 36 months. This program is designed to provide speech-language pathologists with materials that can be used when training parents to work with language-delayed children. The program focuses on six techniques that have been used successfully by parents to strengthen the language skills of preschoolers. The strategies described in this book are based on an interactionist theory of language and focus on the pragmatic aspects of communication. Children with developmental disabilities, hearing impairments, and other conditions affecting language development are among those who have benefited from this program. 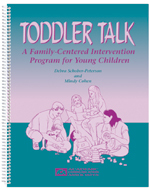 Toddler Talk can be used by speech-language pathologists in workshops or individual parent training programs. Handouts for parents focus on specific strategies that they can use at home to build communication skills (e.g., imitation, turn-taking, building through language expansion). Suggested activities for language stimulation in the home are included.